District 11 Supervisor John Avalos. File photo by Luke Thomas. San Francisco – Supervisor John Avalos is joined by his colleagues Supervisors David Chiu, David Campos, Jane Kim, Christina Olague and a coalition of community organizations and homeowners fighting foreclosures to demand suspension of foreclosure activities in the City and County of San Francisco until such time as state and federal measures are in place to protect homeowners from unfair and unlawful actions by banks, trustees, and mortgage companies. “We have already lost so much due to the unconscionable predatory lending practices and foreclosure fast-tracking of the banks and mortgage industry. 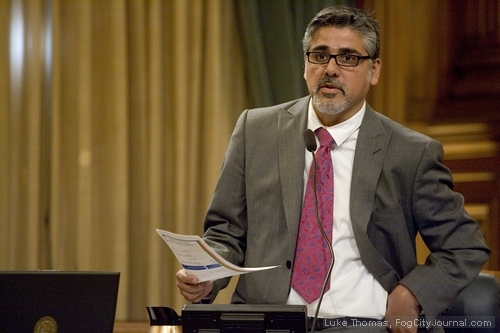 We have to do everything in our power to stop anymore foreclosure activities until such time that state and federal reforms are in place ” said District 11 Supervisor John Avalos, who is the representative to neighborhoods with some of the highest number of foreclosures in the City. The resolution also supports Attorney General Kamala D. Harris call for a suspension of foreclosures of loans controlled by Fannie Mae and Freddie Mac and broad demand for the Federal Housing Finance Agency to provide principal reductions to keep families in their homes. Avalos’s measure urges the Mayor to direct the City’s lobbyist in Sacramento to advocate for the passage of these measures and urges all City and County officials and departments to work proactively to ensure that San Francisco residents do not fall victim to unlawful foreclosure practices and calls on banks, especially Wells Fargo, to suspend foreclosure activities until such time that state and federal measures are in place to protect homeowners from unfair and unlawful practices. Foreclosure victims such as Monica Kenney will be speaking. Monica lost her job in 2010. She reached out to Wells Fargo (her lender) to seek a modification or assistance. In June of 2011 they offered her a forbearance agreement only to sell her home at public auction to Fannie Mae the following day. Monica is still in her home, and Fannie Mae has rescinded the sale back to Wells Fargo. Wells Fargo has been slow to resolve her case and communicate with Monica. in San Francisco are now closed. EXCELLENT. THE STATE OF CALIFORNIA NEEDS TO DECLARE A MORATORIUM ON FORECLOSURES UNTIL THIS MESS CAN BE SORTED OUT. It’s always good to ensure your lender is following the letter of the law when it comes to foreclosure. Unfortunately, foreclosure fraud is all too common. Are you calling for different fines for different property owners? That is blatently unfair, and I doubt you would propose that type of fine on an unforeclosed property, even if the blight is worse. Wanting a specific outcome without looking at other (unintended) consequences is a receipe for disasterous Board of Supervisors’ resolutions and legislation. That’s $1000/day minimum, per building. Someone at City Hall, or on one of the real estate sites, must have some numbers to help make a guess as to what that might add up to. Good consensus builder. I’d also like to see them enforce a few of the very few teeth in the California Foreclosure Prevention Act of 2009. That would mean imposing fines of a minimum of $1000/day on banks who’ve foreclosed on properties showing signs of blight, such as graffiti, broken or boarded windows, broken fences, untended sidewalks. $1000/day minimum. This is great I can stop paying my mortgage. Does it also mean I won’t get forclosed on when I stop paying my property tax. That will save me some money too.